Book suggested for rating by A N Other. I own both the last edition edited by Schumpeter himself and the Bottomore edition. The "BoTtomor" edition is most interesting because Bottomore was a prominent British socialist most interested in Scumpeter's thoughts on how socialism can work and where it might fail. His introductoey essay is really quite good. Schumpeter's thesis, in the 1940's, was that capitalism would be replaced by socialism, not because socialism was more desireable; capitalism would be undone by its own hand. CS&D is a comprehensive theory of capitalist culture; Schumpeter, I believe, would never have stood for a one sentence definition of capitalism. Not because it couldn't be captured thus; but because such a definition leaves no substance to discuss, no context for the lives of individuals and cultures. In the addition pictured, Bottomore takes a crack at summarizing Schumpeter's work. Capitalism will destroy the entrepreneurial function, its own engine, by replacing it with corporate committees and teams. Capitalism destroys the culture in which it took root, a network of small businesses, family connectios and the proprietary values and attitudes that sustain them. Capitalism rewards, cultivates, a "rational" and critical attitude, which becomes a ingrained trait which eventually turns on the culture itself. He downplays a critical element of Schumpeter's thesis: the creation and empowerment of a class of people whose interests run against those of the "capitalist class', the intellectuals. The discussion is too rich to put in a short post. But Schumpeter, speaking in the early 1940's, warns that this class has a vested interest in social unrest and, being economically unproductive, must use the political process to meet their needs. 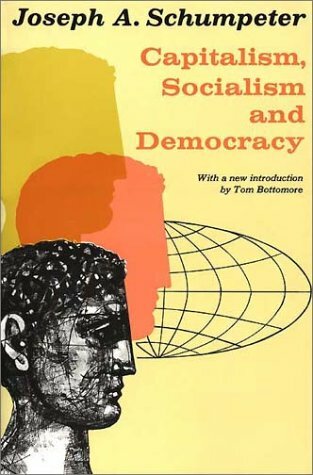 Bottomore's essay is really good in that it lays out the 1970's socialist attitude, the naive belief that socialism could be achieved and could succeed without authoritarian central control. He commends the Yugoslav model, whatever that was. RIP. I can't recommend this book too strongly. The first section is a three chapter discussion of Marx, whom Schumpeter regarded as a great mind gone wrong. the second section covers capitalist economics and culture and predicts the nature of the slide, we may say. The last part discusses how socialism might be structured and how it might or might not work. I confess to not having read that section yet. Up to now I've been living in the second section, as, I think, have we all. A definition states the essence of a concept, not its meaning. Definitions do not "leave no substance to discuss" by only being a definition. If you don't know what a concept means and how it was formed you cannot define it, and providing a definition does not wipe out the meaning. That is why he had to write a whole book on the subject instead of giving a one line definition. capitalism, n. an economic system in which the means of production and distribution are privately owned. I guess we got capitalism here in the USA. Does it follow that the results we see in our marketpalce are the natural and unremarkable consequences of capitalism. Or do I misunderstand your response? THX. This is a poor definition. "The means of production" is a Marxist turn of phrase. Capitalism is the system where all property is privately owned, since only the individual thinks and produces. Can you say that this definition applies to the US? Furthermore, protection of property rights in the US is inconsistent at best. Does taxation respect your right to your property? What about all of the market regulations, including anti-trust and environmental laws, that tell private owners in what voluntary trade agreements they are permitted to commit their own property? Are such regulations consistent with Capitalism? Well, I didn't understand the post above. I don't know the distinction between the essence of a concept and its meaning. My point about Schumpeter was that a big, rich, complex idea surfaces all or most, if its a good idea, of the many facets of a complex problem that must be considered. Rather obviously, if I use the word "capitalism" in this forum, the meaning understood will be different than as the word is used at a Genesee County Progressive Democrats meeting. They think Enron and Fannie Mae are examples of "capitalism". Well, I didn't understand the post above. I don't know the distinction between the essence of a concept and its meaning. You should read Ayn Rand's Introduction to Objectivist Epistemology on the nature of concepts. It includes a great discussion of the nature and role of definitions. It might be helpful to think of a definition as a taxonomy. The purpose of a definition is to distinguish one concept from another. You do this by identifying its essential characteristics, those aspects that differentiate it from other concepts within the same class of things. For any definition you need a "genus", the class the concept belongs to, and the "differentia", the aspects that make it different from other concepts within that category. For example, man is the rational animal. He is an animal (genus), but unlike other animals he has a rational faculty. Furthermore, reason is what explains the greatest number of differences (from speech to skyscrapers), which is what makes it "essential". Notice, though, that the definition of man does not contain all of the characteristics that belong to him. You might talk about anything from the way the human brain works to the range of hair and eye colors that exist, but none of those traits should be contained in the definition. The definition allows you to "file" man in the correct place in your brain, but it is not an exhaustive study of what it means to be human. If you had to know everything about a thing before you could define it, we wouldn't have any definitions. Likewise, private property is the essential characteristic of Capitalism and must be named in any definition of it. However, to understand this system you have to grasp the meaning of private property and its roots, as well as the reason for the prohibition of the initiation of force and the proper role of government in its monopoly on the use of retaliatory force. That's why the definition is a one-liner while the meaning has provoked centuries of writing and debate. An excellent, illuminative post, Bryson. Thanks! In a really nice piece in today's Wall Street Journal (Sat. 7/19), James Grant, publisher of the excellent Grant's Interest Rate Observer, discusses the current mess in the financial markets and asks where is the public outrage? He thinks the answer is the populists - soft money, lots of government intervention - have won a more or less century long battle. Part of Schumpeter's thesis in CS&D is that former members of the capitalist class would come to see their self interest aligned with big government, big institution forces. There is no outrage - well, not much - because most people expect to see things play out as they have. As long as they personally get enough and as long as the usual players do what they usually do, they're ok and the slide will continue. I re-read all of this today and I would characterize CS&D as a discussion of the cultures of capitalism and socialism. It is still an excellent book that accurately reflects the main line of American political and economic development.